As many of you might remember, on August 26, 2017, Hurricane Harvey, a category 4 hurricane, made landfall along the Texas coast and remained in the state until September 1st. 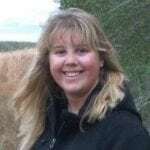 During that time the hurricane dumped over 5 feet of rain on some areas of the state, and that begged the question from many; where does all that water? Well, NASA scientists set about finding out the answer to that question by using Global Positioning System, or as we know it better, GPS, a new study shows. This NASA led study, released yesterday, sought to answer not only where the copious amount of stormwater went on land, but also how long it took the stormwater to go away. 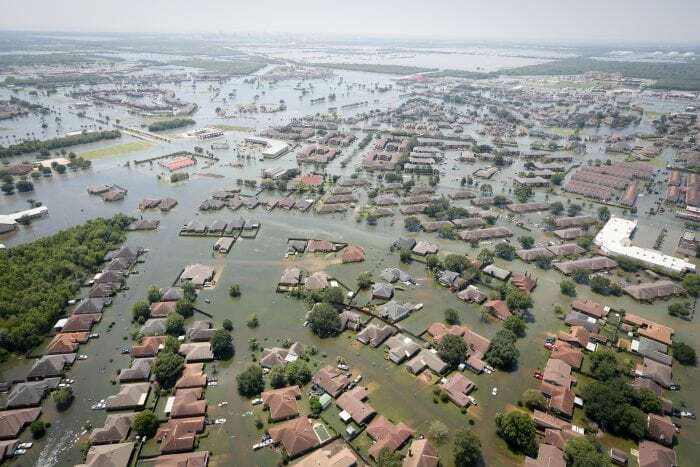 The lead author of the study, Chris Milliner from NASA’s Jet Propulsion Laboratory said, “We determined that in the first eight days post-landfall, 30 percent of Harvey’s stormwater was captured or stored on land — most as standing water that sits on the surface. Around 60 percent was lost or drained into the ocean and Galveston Bay over the first few days after the storm, and the remaining 10 percent was lost via evapotranspiration, or a combination of evaporation and plant transpiration,”. According to the study, that 30% of water then dissipated over a period of 5 weeks. The water either was groundwater runoff to rivers, evaporated, or simply replenished aquifers. The GPS the study used was extremely precise (unlike the GPS on our phones or cars that have absolutely where we are half the time, I’m looking at you Apple Maps) and they used well over 200 ground stations all across Texas and Louisiana to get daily elevation measurements. While that might sound odd, the study made a great analogy comparing the Earth’s crust and stormwater to a mattress. Essentially, when we sit on a mattress it will depress, and the Earth’s crust is just as elastic and acts similarly to that. With the amount of stormwater Harvey dumped on the area, the Earth’s crust actually depressed, just like a mattress would under an amount of weight. Scientists discovered that after Harvey hit the land around Houston actually depressed 20 millimeters. They also saw that the land depressed following Harvey’s position, which isn’t really surprising. As the water slowly began to run off the land rose back up, and they equated it to a mattress going back to its original shape after you remove an object from it. This study is actually important because it shows scientists how the earth can store water, what happens to the earth during a major “precipitation event” like a hurricane, and it allows scientists to see how long it takes water to dissipate. It also benefits people in other areas who have to deal with water and flooding, giving them extra information so they can better understand where water is stored and how long it could take flooding to go away. Lastly, this study also impacts the people living in areas that are hurricane prone so that they can better understand what happens in their local area. This research can be expanded on and improved on in the hopes of learning more about flooding to prepare better for the next major hurricane. If you want to check the study out for yourself you can find it in Science Advances, here. For those who may not remember, or those of you who simply may not know about it, we wanted to refresh everyone’s memory of Hurricane Harvey. Harvey formed in the Atlantic on August 12, 2017, and became a tropical depression on August 17 when it was 500 miles east of Barbados. 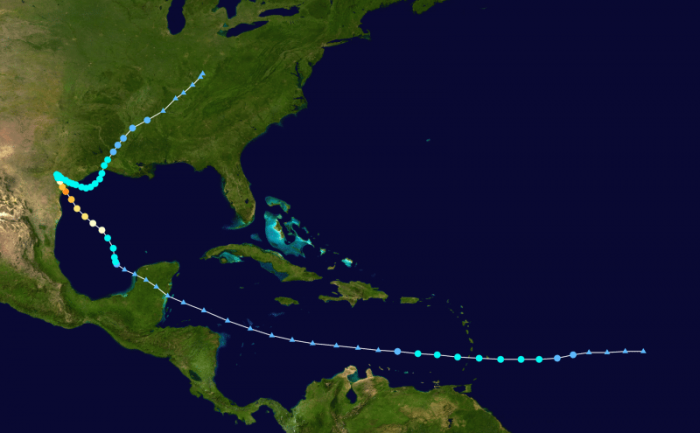 On that same day, Harvey was upgraded to a tropical storm and was given the name Harvey. Harvey made landfall in Barbados on August 18 and actually weakened down to a tropical wave after it entered the Caribbean Sea. The remnants of Tropical Storm Harvey entered the Gulf of Mexico on August 23 and formed back together to reform again to a tropical storm on the 23rd. 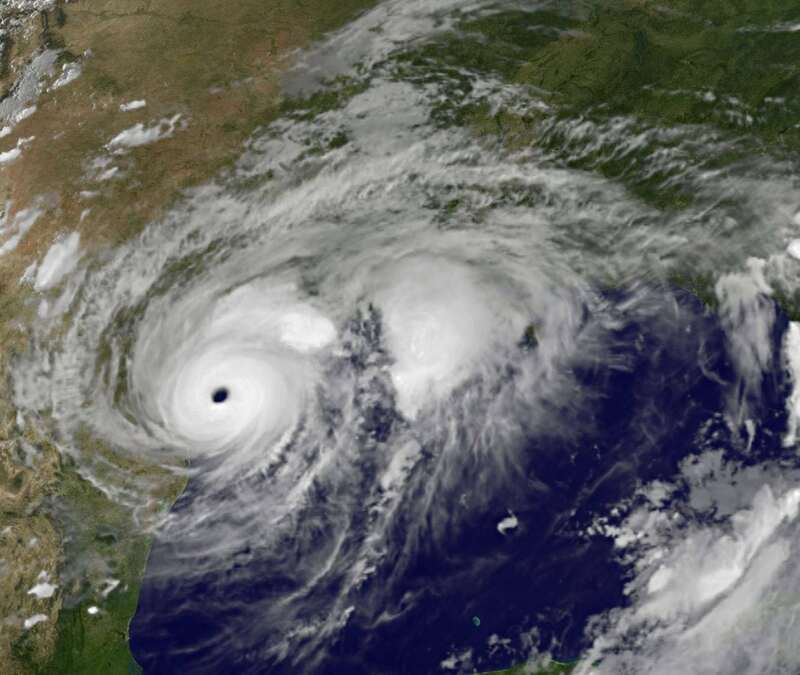 The storm then rapidly intensified and an eye quickly developed, and Harvey became a hurricane on August 24, and by the next day became a category 4 hurricane, maintaining winds of 130 mph. On August 26 Harvey made landfall at San Jose Island (which is just east of Rockport, Texas), and then made a second landfall again on the state 3 hours after that. The storm stalled and stayed stationary for 2 days, dropping heavy rain all across the area. Harvey then went back into the Gulf, then returned onshore and pelted Texas and Louisiana with more record-breaking rainfall. The map below shows Harvey’s track, as well as Harvey’s intensity, marked in different colors. The yellow color represents when it became a category 4 hurricane, and the blue represents when it was a tropical storm (or depression in some cases). In total, 103 Texans died as a result of Hurricane Harvey (68 directly from it and 35 indirectly from it). Almost 50,000 homes were affected by Harvey, and 1,000 of those homes were complete losses (according to Texas Department of Public Safety, however, 185,000 homes were damaged and 9,000 homes were total losses). Hurricane Harvey is actually tied with Hurricane Katrina (2005) as the costliest hurricane on record, doing $125 billion in damages. Harvey was the 1st major hurricane of the 2017 Atlantic hurricane season, but it was the 8th named storm, and it was also the 3rd hurricane of the season. I live about 90 miles north of Houston and my area saw heavy amounts of rain, along with some flooding as well. We got about 24 inches of rain and most places in our city were shut down due to flooding. The video below shows a particular area of our city that was flooded that someone actually required help and search and rescue helicopters were sent out to help them out. Compared to other areas of Texas that were totally flooded over and homes were lost, we had it very easy.